Have archaeologists found the first tools ever made by man? This shocking new discovery by archaeologists in Northern Kenya challenges everything we know about early human evolution. The crudely shaped rocks discovered in Northern Kenya look like the work of early hominids, but something about the tools has archaeologists scratching their heads. According to Business Standard, he stones were estimated to be about 3.3 million years old, which happens to be 700,000 years before the first humans began to walk the Earth. Clearly, something else made these tools. The scientists can’t say too much about the origins of the ancient toolmakers, as the rocks are the only trace archaeologists have been able to find. The study’s authors believe the way the tools were developed can offer valuable insight into how modern cognitive development progressed throughout the course of human evolution. The paper described 149 different stones recovered at the Northern Kenyan site, most of which were described as “cores.” These cores are stones that have been chipped away to expose sharp-edged flakes. The study’s authors theorized that whoever made the tools did so by banging rocks against one another to shape them into a useful form. 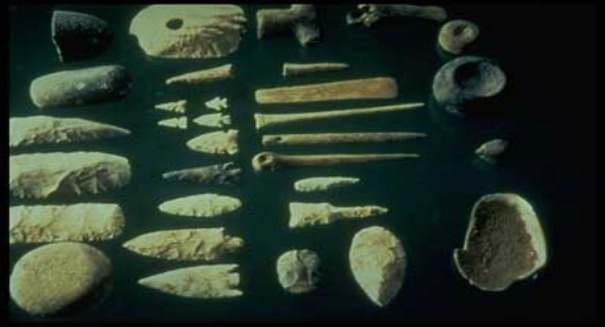 The tools discovered included rocks that could have likely been used as anvils, hammers, and sharp edges for cutting meat. Harmand and Lewis suggest that the original purpose of the newly discovered tools was either to break open nuts or open dead logs to access the insects living inside. The team tried to recreate the process of creating these primitive tools by banging stones against each other, and found that they were able to produce some of the same shapes observed in the tools recovered at the site. They reasoned that the techniques used to form these tools would be easily performed by an early human ancestor, and though they are crude, they are glaring evidence of a breakthrough in early human cognitive development. The Olduvai Gorge in Tanzania is one of the most productive sites for archaeologists searching for ancient tools. Artifacts found in this region date back as far as 1.9 million years, and were likely used by direct ancestors of modern day humans. The stone tools found in this region suggested that early humans had the capacity to plan, think, and carry materials from one place to another. Some of the oldest tools found in the Olduvai Gorge closely resemble the tools found in Northern Kenya, notably in their crudely formed edges chipped away by other stones. The tools found in these regions of East Africa are evidence of the earliest humans’ cognitive development, but the new discovery raises further questions about the timeline of this development. Ancient stones have been discovered throughout East Africa since the mid-twentieth century, and have since led to a rich body of scientific knowledge about human origins. One of the first hominid species, Homo Habilis, was discovered in the region and is believed to have lived as early as 2.1 million years ago. The tools have presented archaeologists with a new mystery, and most importantly, a reason to keep searching for evidence of early human ancestors. The findings suggest that there is certainly much more out there waiting to be discovered.